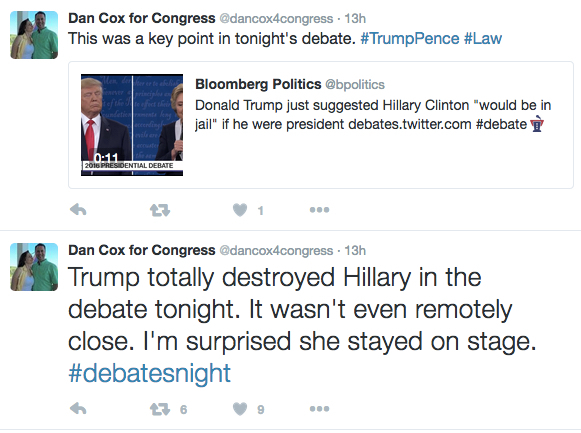 Cox’s twitter feed is a cornucopia of pathetic efforts to reinforce Trump’s tawdry pre-debate presser. Cox thinks this is winning. We get a chance to explain it’s not with our votes on November 8th. The Democratic primary in the Eighth Congressional District is fierce. And no wonder. Whoever wins is virtually assured of becoming a new Member of Congress in this safely Democratic territory. Adam Pagnucco has done a good job outlining the strength and weakness of the three leading candidates (Matthews, Raskin and Trone), so I thought I’d look at how the other candidates may impact the race even if they don’t win. Del. Ana Sol Gutierrez has run a somewhat quixotic campaign that has mainly been about advancing her progressive point of view in debates. Her campaign lacks to money to be competitive even though she has loaned it money from personal funds. Despite the lack of funds, I heard from one voter that saw a television ad. Unfortunately for Gutierrez, advertisements have to play a lot in order to have an impact and her budget is simply not large enough to buy that hefty an ad buy. She has sent out one bilingual piece of mail in the form of a newspaper. Voters may pick it up and take a peek because it’s original. But it has a lot of small print and many photos of the candidate in the style of the North Korean Central News Agency‘s coverage of Kim Jong Un. Despite these limits, Gutierrez may have an impact. She had volunteers at the Lawton Center early voting center in Chevy Chase. Moreover, she has been in public office for 25 years as a candidate for the School Board and then the House of Delegates. Gutierrez’s final political move has been to endorse Bernie Sanders. This seems more likely to do her more good than Bernie, as she links her campaign to a popular progressive and appeared on stage to endorse him at a rally in Baltimore. As the first Latina elected in Montgomery County and a known name, I expect Gutierrez to pick up a good chunk of the Latino vote. Indeed, it seems likely to propel her into fourth place even if she loses much of her past non-Latino support to Jamie Raskin. Raskin seems most likely to be hurt by Gutierrez’s presence in the race. He represents a large Latino community in District 20 and has advocated strongly on a variety of issues from immigration to social justice that Gutierrez also emphasizes. It would certainly be ironic if Gutierrez, who ran to advance progressive issues, ended up costing the leading progressive candidate the nomination. Del. Kumar Barve is a former majority leader of the House of Delegates who represents Rockville and Gaithersberg. Smart and quick, he’s one of the funniest members of the House of Delegates. Like the other state legislators in the race, he has ended up heavily on the liberal side of most issues. Barve has more money than any candidate outside of the top three but remains out of their financial league. He has attempted to gain notice through strong criticisms of Raskin’s ads but my assessment is that these efforts have gained very limited traction. At the risk of making Barve sound far older than he is, Barve was the first Asian American elected in Montgomery County and, indeed, is often highlighted in descriptions of pioneering elected officials. This would seemingly be an advantage in a county with a large and growing Asian American population. Unfortunately for Barve, most Asian Americans identify less as Asians and more by their national origin. As Barve likes to note somewhat ruefully, he has the Hindu vote nailed down with the implication being that just won’t get him far. Barve is one of those candidates who I could well have imagined breaking through but it hasn’t happened for him for a variety of reasons, including Trone’s money attracting so much attention. It would be nice for Barve if he finished well in the portions of the district he represents in the House of Delegates. Will Jawando ran a good but losing campaign for the House of Delegates in District 20, home to Jamie Raskin. Two years later, he has jumped into the congressional race. Jawando is young attorney with a family who is also running on progressive platform and is easy to imagine winning public office in Montgomery County. Jawando’s decision to enter this race surprised many. The safer bet would have been to help Raskin win election and then angle to win appointment to the state legislative vacancy. Jawando would have been a very strong candidate due to his own abilities, respectable finish last time, and links to the congressional winner. While Rep. Elijah Cummings has stayed out of the U.S. Senate race, he has endorsed Jawando for the Eighth District. As the only African American in the race with support from a prominent African-American Democrat, albeit not from around the area, Jawando has the potential to attract some votes. As with Gutierrez, this could hurt Raskin. However, Jawando is less well-known that the long-established Del. Gutierrez, so it’s unclear how big a splash he will manage to make in the race. Joel Rubin is a friend and neighbor. He’s a nice, personable guy who, like many in Montgomery County, has been active in federal politics but at the local or state level until now. Rubin has raised a nice sum of money and run a good campaign even though he just lacks the funds or previous support base to be competitive. Like Will Jawando, I would not be surprised to hear more from Joel Rubin in the future. Finally, I know little about Dan Bolling and David Anderson. Bolling is running as the anti-partisan candidate and Anderson appears to be a well-meaning progressive. I do not expect either to have a major impact on the outcome of the race. Click on the links to learn more about them. Once this election is over, Democrats all over the Eighth Congressional District are going to feel jilted as the never ending stream of direct mail from David Trone comes to a sudden halt. So I’m playing this one in advance of primary day. Seriously though, David Trone is running an excellent campaign. Many wealthy people decide to run for office but are completely oblivious to their lack of political expertise and spend their money badly. David Trone has hired experts, and he has hired good ones. Trone’s direct mail is not only plentiful, it’s attractive and well-designed. It comes in a variety of formats. If you don’t read the postcard, maybe you open the letter. It’s also targeted; I received at least two pieces based on my ethnicity. His television ads are similarly well done based on the few I’ve seen. Thanks to the blessings of Tivo, I see fewer political ads than many. (Some friends are impressed that I manage to watch TV not see most of Trone’s ads.) Increasingly, I suspect, viewers of commercials on television skew older. But that’s not bad in a primary because so do the voters. Younger viewers may have been forced to watch when they viewed shows online, as most do nowadays. I imagine I might’ve seen more videos for Trone if I clicked on the many net ads, though I wonder greatly if they are effective. Trone also has a large staff of paid canvassers. They’re way better than paid people that I’ve seen in most state legislative campaigns, who usually can’t wait to dump the literature and get home. Nonetheless, Trone’s people remain less passionate and knowledgeable than volunteers. Scratch the surface of his pleasant crew, though I am not sure many do, and they don’t know much about their guy. The canvassers are also well targeted. Anyone who requested an absentee ballot soon had a Trone canvasser at their door. And Trone has very heavily promoted absentee ballot requests from people who have not voted in primaries previously. If Trone loses, it won’t be because he spent his money badly. The real question remains why Trone wants to be a freshman member of Congress. It doesn’t seem to be any particular issue passion. A clear campaign weakness is that his stances on public policy are cookie cutter and undeveloped. Beyond wanting this to acquire this particular political success and to highlight his considerable business acumen, one wonders why he doesn’t run for an office where he could really shake things up. A Trone campaign for County Executive would sure unsettle the plans of most of the County Council. Unlike most state and local races below the level of Governor, the contest in Congressional District 8 has seen a lot of television ads. These ads are trackable, although not easily. Today we present a first cut on who is advertising where, and for how much. The Federal Communications Commission (FCC) requires TV and radio stations to report on political ad purchases. In 2012, the FCC required broadcast TV stations to post political ad purchases on the agency’s website, but with a large caveat: the files are in pdf format. They are not accessible through spreadsheet or database software, and are therefore not readily crunchable. They are also not searchable. A researcher has to go through every relevant station, one at a time, review all pertinent folders and manually enter the data to prep it for analysis. This is a challenging and time consuming task! The data is also incomplete. Cable and satellite TV stations and radio stations are not currently required to report their political ads to the website, although they will be starting in the next cycle. Furthermore, the reports do not include production costs. They only include amounts paid to the TV stations, both gross and net of commissions. So the information reflects only a portion of candidate spending on TV. That said, broadcast TV is an important part of large-scale federal elections and data on it is worth looking at. We assembled political ad data for all CD8 candidates in the year 2016 for all of the Washington area’s broadcast TV stations. Contracts often cover a week or more into the future, so the most recent ones we obtained are active through April 16 – ten days before primary election day. The broadcasters reported a combined total of 127 contracts through noon, April 4. Here is the number of spots and gross amount for each broadcaster reporting. Unsurprisingly, the big four networks dominate. Also not surprising is that WRC-TV, long the top-rated local network, is a runaway leader in ad spending. David Trone kicked off the 2016 ad season on January 26, when he began advertising on every network in our dataset. On February 7, he paid for five spots worth $200,000 on WUSA on Super Bowl Sunday. (That amount is more than what most candidates for State Senator and Delegate spend in their entire campaigns.) Kathleen Matthews began advertising on February 8. Jamie Raskin joined in on March 24 and Kumar Barve followed on April 6. The drop in total spending between February and March was caused by a decline in Trone’s spending, part of which is due to the fact that there was no Super Bowl in March. April spending is down because the contracts have not all been reported yet. Trone dominates this category of spending, accounting for the majority of spots and roughly three quarters of gross amounts paid to broadcasters. There are big differences in the costs paid by the candidates, and that reflects their strategies. 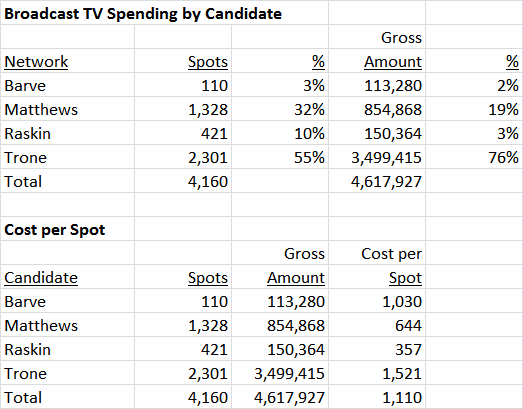 All four candidates advertise during news programs and those shows tend to charge the highest rates. Matthews mixes in cheaper daytime television like The Meredith Viera Show, Days of Our Lives, Who Wants to be a Millionaire, CBS Soaps and The Insider. Raskin is keeping his costs down by running 15-second spots, half the length of his competitors. Trone’s edge in TV has been eroding over time. He had January all to himself. But his CD8 TV market share dropped to 82% in February, 73% in March and 44% in April (so far) as other candidates have gone live. (That April number could change a lot!) Late TV commercials may mean more than early ones because many voters, especially casual ones, make up their minds late. A few other things are worth mentioning. Trone’s real dominance may not be on TV or in mail, but in his digital advertising program. His ads are everywhere on the Washington Post and Bethesda Magazine websites. There is no known source of reporting on those ads outside of the candidates’ campaign finance reports, and even they may be a bit murky. In any case, Trone is making a big bet on digital and his opponents are not. Matthews reported an end-of-year cash balance of $1.1 million, but this data shows that she has spent over $800,000 on broadcast TV alone. Matthews has a formidable campaign operation, with staff, field, mail, office expenses and more. This suggests that she has had a strong fundraising quarter, or is self-financing, or perhaps both. Raskin is emphasizing mail over TV. He has the second-most extensive mail program in the race behind Trone. This is a deliberate calculation. Mail is much easier to target than broadcast TV. Mail can be sent to regular Democratic primary voters – the people who tend to pay closer attention to elections than others – while TV ads are sprayed into the ether to be viewed by regular voters, casual voters, non-voters, members of other parties and residents outside the district. Raskin believes that regular voters will support him if they know that he is a) very liberal, b) very experienced in passing liberal bills and c) has a better chance to win than the other liberal elected officials running against him. (That message has offended Barve, who has been in office for sixteen years more than Raskin and is a high-ranking member of House leadership.) All three publicly disclosed polls in the race show Raskin at close to 30% of the vote. If he can hold on to his supporters and his mail strategy gets him another five points, could that be enough to win? How much does TV spending matter? John Delaney won his seat in Congress in part through TV ads, and David Trone has so far spent at least double his total. Kathleen Matthews trails, but she has spent enough to be heard. The other candidates have not made a major commitment to TV. Will they pay a price for that? We will have an update on this data shortly before the primary. The shadow of Total Wine co-owner David Trone has loomed large over CD8 since the day he got in the race. Rivals fear his apparently limitless self-funding. His opponents say they are “fighting big bullies” and “under fire from big money.” Their supporters perceive Trone as a Potomac plutocrat bossing, blustering and buying his way into office. Laptops and smartphones groan under the weight of his omnipresent digital ads, begging their owners to be shut off until after the election is over. So who is this guy and why is he running for Congress? In person, David Trone is a disarming character, far different from what one might expect of a wealthy, Wharton-educated CEO. He is by turns ebullient, gregarious, intense, and blunt. He possesses all the nuance of a nose tackle on the goal line. Argue with him and you will get a roaring laugh and a jabbing index finger. Trone’s political mastermind, Andrew Friedson, is no doubt trying to smooth out these edges. Earth to Friedson: it’s not gonna take! Understanding Trone requires appreciation of two key aspects of his life experience. He sees himself as an underdog even if others do not. Trone called himself an underdog as he launched his campaign despite his nearly unlimited self-financing capacity. This is a recurring theme in his life. Trone’s father held a number of occupations before buying a farm and ultimately losing it due to alcoholism, leading to divorce and economic hardship for his family. Later, Trone put himself through Wharton with a combination of loans, selling eggs and running his first beer store when he was not in class. (Once his chickens caught avian flu and died, Trone concentrated solely on beer.) These were clear disadvantages compared to Trone’s privileged, blue-blood classmates who aspired to be the next Gordon Gekko. Trone may be wealthy now, but his mentality remains that of the I’ll-show-you Pennsylvania farm boy who surpassed his supposed betters. That mentality gives him the edge he uses to win. In certain localities, the alcohol retail industry behaves like a political-economic oligopoly in which trade associations collude with politicians to draft anti-competitive laws, thus benefiting both of them. Trone ran into this shortly after he opened his first beer store in Harrisburg, Pennsylvania and began advertising his low prices. His competitors persuaded the state legislature to outlaw the practice and Trone was arrested. The law was thrown out when the U.S. Supreme Court ruled against a similar law in Rhode Island. Trone is frequently opposed by native competitors when he attempts to expand into new markets, including Minnesota, Texas and Connecticut. One local trade association even drafted a handbook on how to compete with him. A state bill designed to keep him from expanding is now pending in Tennessee. Trone is detested by his competitors across the nation, and he wears that as a badge of honor. His business model combining low prices, large selection and highly trained customer service is massively disruptive, forcing his competitors to step up their game or shut down. Trone’s view of the American political system is shaped by this experience. Like local alcohol markets, he sees Congress as a place that is dominated by an iron cartel of special interests and venal politicians that ultimately does not deliver on behalf of constituents. Trone has disrupted the alcohol business, and now he wants to disrupt politics. How would he do this? Trone waxes nostalgic for the days when members of Congress formed friendships with each other regardless of party and figured out how to move the ball forward. He estimates that he has stores in 101 Congressional Districts and engages in significant charitable activity in all of them, thereby creating some commonality with colleagues on either side of the aisle. Impervious to the constraints of fundraising and party hierarchy, he is not subject to the typical factors that whip House members into line behind their leadership. Trying to intimidate him would be like trying to stop a rhino with a peashooter, as many competitors have learned to their detriment. Trone’s beliefs in independence, relationship building, working with the opposite party, negotiation and common interest may seem naïve by today’s standards, but does anyone believe that the perpetual partisan warfare now in Congress benefits the country? Trone is vulnerable on the issue of money and political influence. Trone the businessman frequently hires lobbyists and makes political contributions to battle his competitors, who of course do the exact same things. A notable example is in Connecticut, where he is trying to throw out a state law that sets minimum prices for alcohol. (Can there be anything more odious to consumers?) Trone the candidate takes credit for helping consumers in his mail, but decries the use of lobbyists and political contributions which he himself has employed as a businessman. Trone declares on his website without a trace of irony, “I have learned firsthand the problems with political donations.” We bet he has! Trone’s opponents are sure to accuse him of wanting to have this issue both ways and he needs a convincing comeback to use in his defense. In the eyes of the local political establishment, perhaps the most disquieting aspect of Trone is that he has defied the customary ways of moving up in MoCo politics. Most people who aspire to elected office here rise up through the party precinct structure, the civic community, county advisory committees and/or political-governmental staff positions. They go to event after event, network with the similarly ambitious, defer to those who require it and go for smaller positions before trying for bigger ones. Congress is regarded as at or near the top of the heap. Trone the disrupter eschews all of this, preferring to spend millions on TV and mail rather than kissing political rings. A not insignificant portion of anti-Trone sentiment from local Democratic activists derives from his failure to pay his dues. “You can’t do that!” they say. But David Trone does what he wants and it has been that way ever since he was a young man, selling eggs and dreaming of better things. David Trone has disrupted the alcohol business. He has disrupted the CD8 race. Will he get a chance to disrupt Congress? That’s up to you, the voters, to decide. At Marriott Matthews oversaw the company’s political action committee, which contributed more than $1.4 million to candidates between 2008 and 2014, including nearly $700,000 to Republicans, according to data compiled by the Center for Responsive Politics. Matthews said in an interview last week that Marriott employees were free to designate which party they wanted to receive their money. She also said decisions about specific contributions were made by lobbyists who reported to her. As the lobbyists reported to Matthews, she retained responsibility for the donation decisions. Her explanation makes it look like she is attempting to push off that responsibility on to her subordinates. The consequences of the Government’s construction confirm why it cannot be the law. Extending bribery beyond efforts to direct a particular resolution of a specific governmental decision would upend the political process, vesting federal prosecutors with extraordinary supervisory power over every level of government. If “official action”includes anything that could “have the purpose or effect of exerting some influence” on any imaginable sovereign decision (Pet.App.54a), then every official and campaign donor risks indictment whenever heightened access is provided in close temporal proximity to contributions. That happens literally every day at political fundraisers nationwide. As one businessman seeking public office recently explained: “I sign my checks to buy access.” Bill Turque, David Trone Has Donated More than $150,000 to Republicans, Database Shows, WASH. POST, Jan. 28, 2016. Now, there is an important legal difference between buying access via campaign donations – referenced here by Trone – and through direct gifts to the official. Nevertheless, McDonnell’s attorneys cite Trone’s statement as an explanation for why it’s acceptable that McDonnell used his powers as Governor to aid a businessman who gave him a Rolex and helped to pay for his daughter’s wedding. Cynicism about the process is helping to power both Donald Trump and Bernie Sanders’ campaigns in very different ways. Sanders decries the corruption of American politics through corporate campaign donations. Like Trump, Trone says forthrightly that, of course, he was “buying access.” A central basis of the Trump and the Trone campaigns is that they are so rich that they cannot be bought. Their wealth has become a qualification for office. 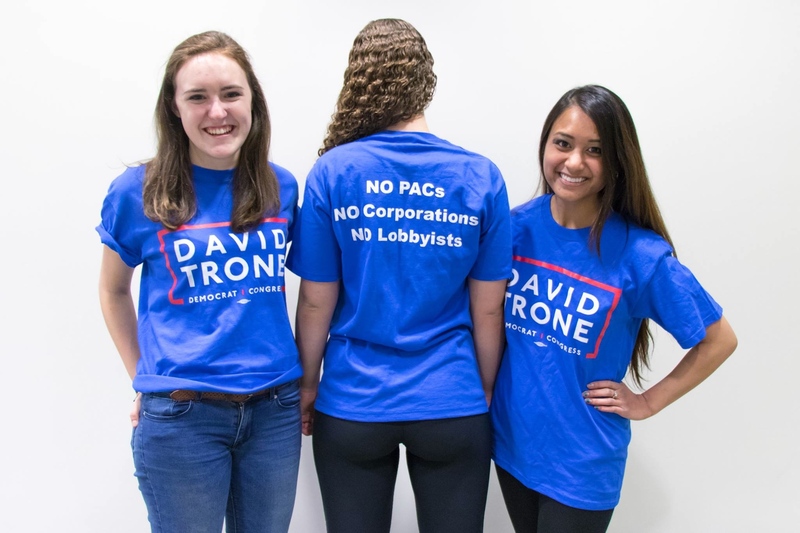 His campaign t-shirts even brag “NO PACs, NO Corporations, NO Lobbyists.” While a great slogan, the fact remains that David Trone runs a company that makes exactly these sorts of donations and that company employs lobbyists. The Center for Responsive Politics reports that, for example, Total Wine gave $12,500 to support Mitt Romney‘s presidential campaign. I’m not bothered that Trone has a lot of money or is stimulating the economy by spending so much of it on his campaign. But why Trone thinks that he is a superior candidate because he is the corrupter rather than the corrupted remains a mystery to me. CD8 residents are in the midst of an historic election, not merely because the congressional seat is opening up for the first time in fourteen years. What makes it historic is that one candidate, Total Wine co-owner David Trone, is on pace to shatter spending records in local races. 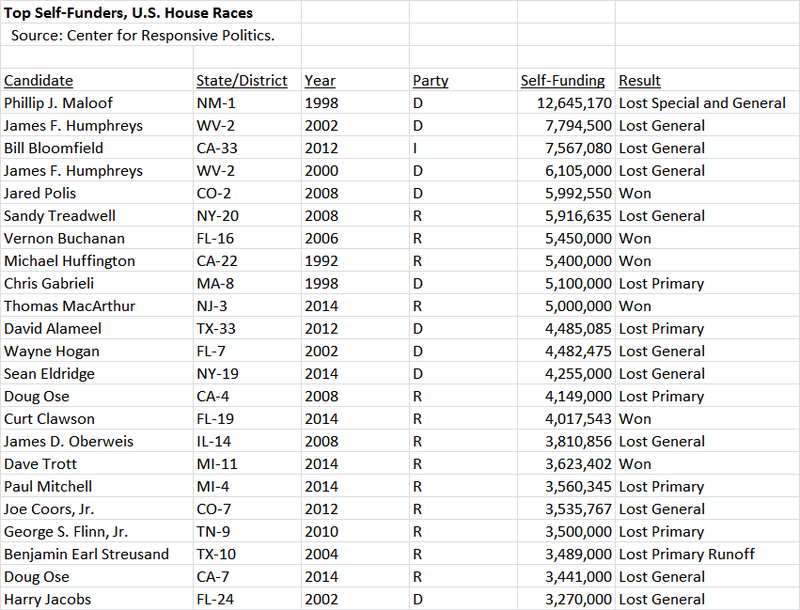 In fact, he may wind up being the top self-funder in a U.S. House race anywhere in the country for all time. Since announcing for Congress a month ago, Trone has deluged CD8 residents in mail, digital ads, paid social media, television commercials and more. Our sources estimate that Trone has spent roughly $2.5 million on television and radio ads alone through the end of February. (That’s about five times what Kathleen Matthews has spent.) Throw in the cost of mail, digital, staff, vendors and campaign expenses and Trone has probably spent at least $3 million in one month of campaigning. That puts Trone on pace to spend $10 million – and probably much more – by the end of the primary. How does that stack up against expenditures in other prominent local races? We added up spending totals of recent competitive races for Governor, U.S. Senate, U.S. House and Montgomery County Executive contests. For Governor, we included Lieutenant Governor and slate accounts and deducted transfers between them. 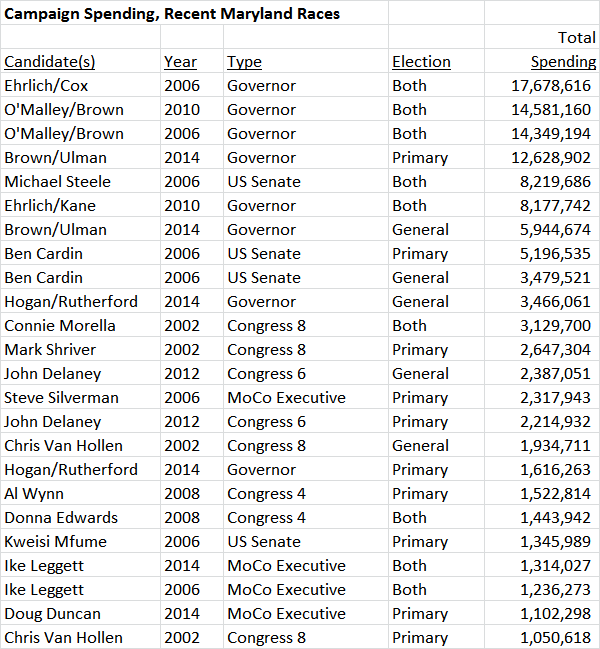 Primaries and generals are listed separately unless either one was non-competitive, in which case we combine them and list them as “both.” The data appears below. Trone’s spending could eventually be comparable to some gubernatorial races. He probably won’t touch Bob Ehrlich’s total as an incumbent in 2006. But he could approach the totals of Martin O’Malley’s two races and the amount spent by Anthony Brown in the 2014 primary. He will almost certainly exceed what Ben Cardin and Michael Steele spent in their 2006 U.S. Senate race. And he will blow away any candidates in U.S. House and Montgomery County Executive races in recent years. Trone’s campaign is almost entirely self-funded. He has said that he will spend “whatever it takes” to win. How will he compare to other self-funders in U.S. House races? The Center for Responsive Politics periodically releases estimates of self-funding. Below is a compilation of everyone we can identify who has contributed at least $3 million to their own campaigns, which is roughly the level Trone has so far given to his. Self-funders come from both parties, often run in big states and usually lose. The combined record of the above candidates is 6-18. Phil Maloof, the leading self-funder, should have an asterisk next to his name because he lost both a special election and a general election to future Congresswoman Heather Wilson in the same year. (Interestingly, Maloof’s family derived part of its fortune from beer distribution.) If Maloof is discounted from the above list, David Trone could well be the top self-funder in a U.S. House race of all time, anywhere. Even including Maloof, Trone could still be number one. The Big Question in CD8 is . . . will it work? Candidates in both Congressional Districts 4 and 8 are targeting predictable Democratic Party constituencies like women, liberals, environmentalists, African Americans and Latinos for votes. That’s standard operating procedure in most Democratic primaries. But because of the geographic peculiarity of the two districts, there’s another constituency that could play a major role in deciding the election: federal employees. 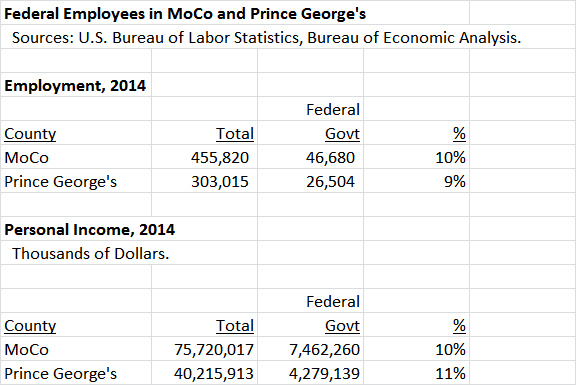 Because Montgomery and Prince George’s Counties border the District of Columbia, they have countless thousands of residents who commute to federal jobs downtown every day. The two counties also have numerous large federal employers of their own, including the National Institutes of Health, Andrews Air Force Base, the Census Bureau, NASA, the Food and Drug Administration, the Department of Health and Human Services, Walter Reed, NOAA and more. Prince George’s is making a strong bid to host the FBI. Anne Arundel County, which has part of CD4, is home to Fort Meade and the Naval Academy. According to the U.S. Bureau of Labor Statistics and the U.S. Bureau of Economic Analysis, federal employers constitute about ten percent of each county’s employment and personal income. But this counts only federal establishments located within each county; it does not count residents who commute outside their boundaries. It also doesn’t count contractors who depend on federal clients or the various industries surrounding the federal government, like lobbying, consulting and legal services. One private sector economic firm estimates that 52% of the Washington area’s total job base is tied in one way or another to the federal government. Regardless of the statistics, it’s reasonable to assume that both CD4 and CD8 have tens of thousands of residents who either work directly for the federal government or who have family or friends who do so. It’s also reasonable to assume that they vote, particularly in Democratic primaries. One thing that can be said about this group is that they are under stress. Consider recent events pertaining to federal employees. While many federal employees are represented by unions, their pay levels are set by federal law and not by collective bargaining. Federal pay was frozen during the 2011-2013 period and rose by 1% in 2014, 1% in 2015 and 1.3% in 2016. Accounting for local area price inflation, federal employee pay fell by 7% in real dollars between 2010 and 2015. Federal employees do not have paid parental leave. When they have children, they must either use accumulated sick leave and vacation time or accept unpaid leave. When Sens. Barbara Mikulski and Brian Schatz (D-HI) introduced a bill to provide paid leave last year, Schatz noted, “While private companies are beginning to see the benefits of providing paid family leave, America is still the only industrial nation in the world without a program that gives working parents the time off and income they need to care for a new child.” President Obama provided for paid leave in his latest budget, but congressional Republicans are ignoring it. The rise of a Tea Party Congress led to a spending sequester and a government shutdown in 2013. Shutdowns were barely avoided in September and December of 2015. The sequester has chilled not merely the federal government but the entire regional economy for years. Congress’s growing reliance on continuing resolutions and last-minute budgetary showdowns have played havoc with department budgets and make it harder for federal employees to do their jobs. One federal manager commented, “What people don’t realize is that once the budget is approved, it takes time for the money to trickle down to agencies. For example, managers in my agency still don’t have the ability to spend their budgets without getting approval for everything from a contract to a stapler. And we don’t have a firm estimate of when we will be able to spend freely.” Training and travel are often adversely affected. Make no mistake: Congressional Republicans are targeting federal employees. Last year, the House and Senate each proposed budgets that went after the federal workforce. According to the Sun, “While details of the House and Senate versions of the budget differ, both chambers have approved slashing the size of the federal workforce by 10 percent through attrition, increasing the contribution workers make toward their retirement savings and cutting the share of health insurance covered by the government.” Months later, Senate Republicans floated a plan to fund highway spending by cutting federal pension rates of return. The Chair of the Senate’s committee that oversees the federal workforce opposes the existence of federal unions, wants to trim pension benefits and wants to cut the federal workforce by 10% and contractors by 15%. Another Republican Congressman wants to eliminate dues checkoff for federal unions, a move designed to cripple their finances. U.S. Senator Barbara Mikulski and Congressman Chris Van Hollen have been strong advocates for federal employees and that has been a component of their immense popularity with their constituents. All candidates in both CD4 and CD8 would be wise to emulate their example. Whoever emerges as the top defender of the federal workforce might get an edge in what could be two close races. Center Maryland Columnist Josh Kurtz has written must-read analysis on the race for the Democratic nomination in the Eighth District. Fearless in its criticism, I doubt any of the candidates will be rushing to put quotes from it on their brochures. In this primary, for starters, we have the mega-rich and the merely rich. In the former role is David Trone, the Bethesda booze baron who entered the Democratic primary just two weeks ago and immediately dropped $900,000 on TV and web ads, which have already become unavoidable. In the latter category is Kathleen Matthews, the former broadcaster and Marriott executive who is married to MSNBC yakker Chris Matthews. Kathleen and Chris are part of the D.C. elite. . . .
[Y]ou also get the feeling that Trone and Matthews don’t know a lot about the rest of us – and the communities they are presuming to serve. Do we really want someone with a sky’s-the-limit approach to campaign spending like Trone to represent us in Congress? Do we want someone like Matthews who seems to be accepting campaign contributions from every K Street lawyer, D.C. financier, media celebrity and bold-faced name? State Sen. Jamie Raskin is an accomplished legislator, a genuine progressive, a nice guy – and a legal scholar to boot. But he has said he wants to be “a transformational” member of Congress – when all he’ll be, for the foreseeable future, is a junior member of the minority party. Raskin is running a grass-roots campaign. . . . But this isn’t quite like Bernie Sanders . . . . Raskin has plenty of big donors, too – from the extensive list of D.C. lefty intelligentsia. Del. Kumar Barve . . . is also an accomplished lawmaker and a nice guy – and doesn’t take himself too seriously. But Barve has been perhaps a little too cautious in his political career. 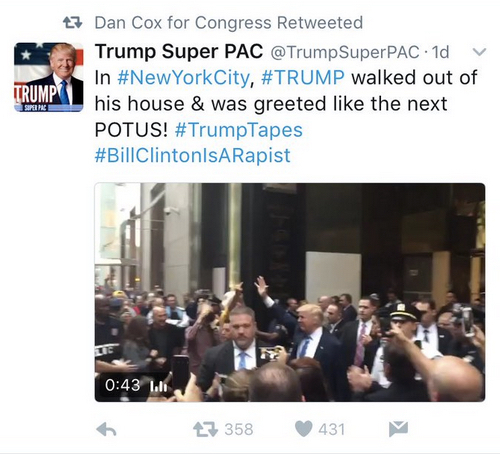 You can’t help feeling that somehow, his moment to ascend to Congress should have been a decade or two ago. Del. Ana Sol Guttierez is also a committed progressive who was one of the first public figures . . . to acknowledge and craft policy that reflected the county’s demographic changes. 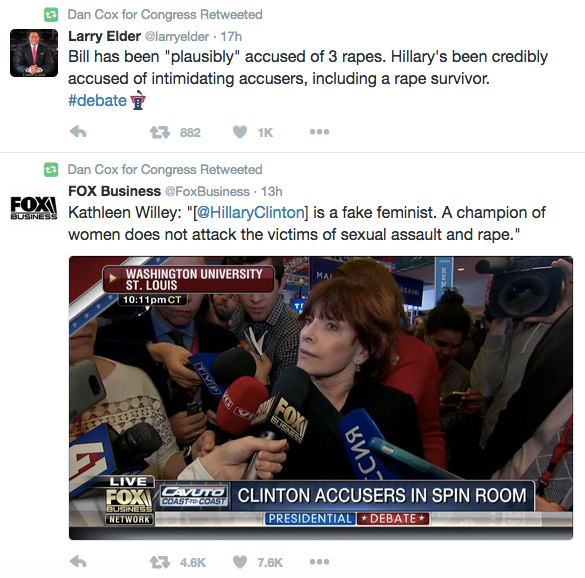 But she has never really laid out a rationale for her congressional bid. Gutierrez would be a freshman member of Congress at the age of 75. She is not running a serious campaign. Will Jawando and Joel Rubin are young guys who have worked for the Obama administration and on Capitol Hill. There are tens of thousands of people just like them rattling around the D.C. area. They are smart, attractive guys and dedicated public servants with political acumen . . . . But maybe they should have looked at running for a more humble office than Congress to launch their political careers.